A vegan supermarket is a dream come true for many of us. Europe is ahead of the trend, with vegan supermarkets popping up since 2011. Well, I have some good news for my American friends, at least those on the West Coast. 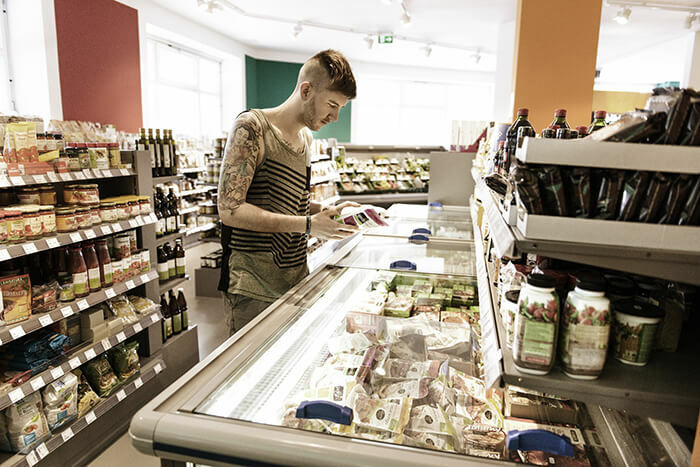 The German vegan supermarket chain Veganz is scheduled to open a store in Portland, Oregon later this year ,in 2016. Veganz also plans to open a shoe and clothing store, as well as a restaurant, in the same city. I admit, it’s not easy to be vegan in our modern society. Just last week I went to the health store and bought some new supplements to try. And even though I told the shop owner that I am striving to buy only vegan products, she still recommended a chewable D vitamin, and I bought a bottle to try. I got mad at myself for not reading the label until I had reached home and already opened it One of the ingredients was palm oil. Now, palm oil is technically a plant. But because the harvest and production of palm oil leads to the destruction of rain forest habitats, I was not happy about supporting a product so destructive to the environment. I chalked it up to a learning experience, and promised myself to practice mindfulness by reading all labels in the future. Shopping at a vegan supermarket is an exciting prospect for me, because I know I will not have to read labels in caution for animal welfare when I shop there! If you want to get updated you can do so by signing up for their newsletter in English or on social platforms.